Do you often experience similar case as above? When the deadlines are coming close, it makes us feel like we cannot spare those precious 30 minutes to get out of the desk. Everything can happen in minutes, so if we take lunch away from the telephone and computer, we are afraid that we will miss urgent calls or emails. Most workers will agree that eating at their desk is not an uncommon activity. In fact, most of us must have done at some point in time. There are various reasons why people choose eating at their desk rather than allocating some time to the office cafeteria. Some people think that getting lunch at their cube or desks is okay because it will save them time and is more practical, while some others are simply too comfy sitting on the chair that they do not care to move. Whatever the reason is, lunch is not merely sometime to gulp in food, so you have energy to get the job done. 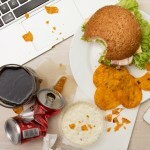 One obvious reason to never eat lunch on your desk is because it will make your cube all messy and smelly. Desk is the place where you finish your jobs, so you should make it comfortable to keep it clean and neat. If you bring your lunch to the desk, imagine eating sandwich or toast and you accidentally leave crumbs here and there. It will make the table all dirty and ants soon come swarming the desk, not to mention the mess it will create. In addition, lunch will make your cube smelly, especially if you bring strong smelling foods such as onions, cheese, pickles, sauerkraut, or ginger. Even if these smells are perfectly fine to you, it will spread to the entire room and you can never know how your co-workers will react. So to be safe, it is better not to do such a thing. If you keep refusing your co-workers invitation to eat outside, they would get wrong ideas that you hate socialising with them. Not only will it cause misunderstanding, but you will also lose an opportunity to build interpersonal relationships with your colleagues. In work relationship, to create better teamwork, it is important to know your co-worker personally. By having lunch together, you can share personal stuffs such as families, hobbies, interests, or simply latest gossips. Simple and light conversation will help you know better your co-workers better and exchange positive vibes. By doing so, it will create better communication that will be useful in accomplishing projects and tasks. Moreover, if some conflicts among colleagues arises in the future, you will know how to deal with them as you know their characters and personalities. What happens if you have lunch while staring at your computer 9 hours straight in a day? Multitasking and finishing the job earlier? Nope. It will only make you unhealthy. First, you will only be stressful as you cannot get your attention away from work. Second, you have no chance to get up and move from your desk, which is not good for your bone. Third, staring at the screen too long will make your eyes tired and worsen your eyesight. Fourth, you cannot get fresh air to energise your mind. Fifth, you will have no time for a short-walk after lunch to burn some calories so the foods will not pile up and become fat. Considering all these disadvantages, are you still reluctant from taking lunch break outside of your work desk? Surprisingly, eating lunch at the desk does not make you more productive. Contrary to popular beliefs, eating lunch at desk does not improve one’s productivity and efficiency. If you think that you can focus on the job while munching your lunch, you are wrong. Our body and brain has physical limitation that needs to be rested, and eating out with your co-workers is the simplest thing you can do to refresh them. After coming back from lunch, you will be ready to maximise your productivity until the rest of the day. Human beings are not a tireless robot. At the workplace, lunch is the perfect time when you can get mental breaks to keep your health and sanity. If you happen to read this piece while lunching at your desk, then move out of your seat now and join your co-worker outside. Next read: Is Working Shifts Compromising Your Health?